Well, this is some exciting news for language teachers! 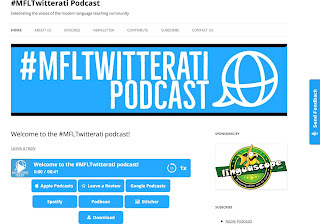 Joe Dale is launching the brand new #MFLTwitterati Podcast! sponsored by Linguascope. Joe's been working for months putting together the first installment of the series, with considerable help and enthusiasm from American teacher Noah Geisel. "The podcast is aimed at anyone interested in language education at all levels, as well as fans of EdTech and is divided into specific sections. We begin with the radar section where Noah and I talk about an idea, resource or new app or web tool update which has particularly caught our eye recently. Then comes the #mfltwitterati takeaways where Noah and I discuss tweets tagged with the #mfltwitterati hashtag that have particularly resonated with us. Next, we have the MFL show and tell section where members of the #mfltwitterati describe a class activity they have found to be effective or an event they have attended. Following that is the techtalk interview where Noah and I speak to a language educator about how they are integrating tech into their practice and we unpack some of their tips and tricks." Having had a sneak preview I can tell you that you'll hear a wide variety of voices and practical MFL classroom ideas, with input from lots of teachers on the front line. I would certainly give it a listen and consider contributing to future editions. I'm sure you'd agree Joe deserves huge credit for all the help he offers to teachers around the world, especially when it comes to digital technology. He's been at the forefront of online networking between teachers around the world for a good few years. So one thing I particularly like about this initiative is the fact that it crosses borders. We tend to be very parochial in teaching, paying little attention to what's happening in other countries. This podcast, along with other initiatives such as the GILT Facebook page (Global Innovative Language Teachers), contributes to a wider, more eclectic perspective on language teaching. Listen to the welcome message here.